Location: Nisbet, Scottish Borders, Scotland. 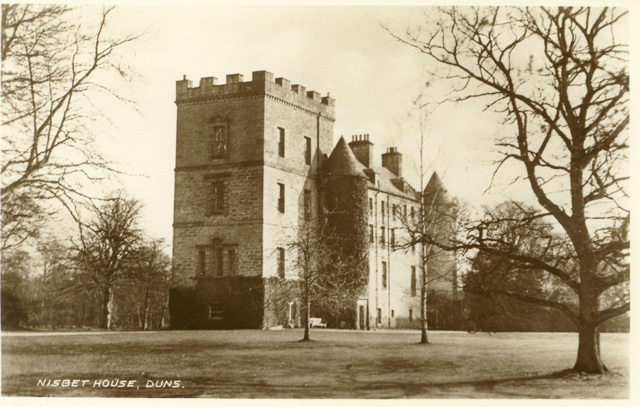 Notes: Nisbet House is a 17th-century mansion in the Scottish Borders. It is located on the north side of the Blackadder Water, 2.5 kilometres (1.6 mi) south of Duns, in the Merse, a low-lying part of the former county of Berwickshire. It was built in about 1630 by Sir Alexander Nisbet, ancestor of the heraldic authority Alexander Nisbet (1657-1725). Architectural evidence suggests that the building incorporates, at its eastern end, a square pele tower that was the former house. The house is protected as a category A listed building.